What I am eating is a link up for recipes and other food related posts. Since this month I am concentrating on getting Back to Basics and since I am writing about local eating this month, I thought it only fitting to include local food! Feel free to link up any recipes or food related posts below, they do not need to be all local! Fall to me means a lot of things, but one of the biggest is apple picking season. My family loves apples, I mean really loves apples. The kids will eat apples all day long if I let them (and I often do!). But, I also use apple picking season to do a lot of preserving for the winter. This includes apple jelly and apple butter, but also applesauce. Applesauce is one of those very home-y foods to me. Not to mention it makes the house smell amazing while it is cooking! Also, it is incredibly easy to make. Add some chopped up apples and a little water into a pan, and simmer until the apples break down. Some people like to mill it so it is super smooth. I just crush it with a potato masher. Easy and delicious! When I can applesauce I don’t add any sugar or cinnamon to it. I just can it as is. But, when I make it to have fresh from the stove, I definitely add some cinnamon and a little honey to sweeten it just a bit. Obviously cinnamon is not local to my little part of the world, but I am fully in support of spices, so it is on my list of non-local ingredients I will use. Do you make your own applesauce? What is your preferred way of eating it? Please link up your food related posts and recipes below! Nothing like Homemade applesauce! Thank you for hosting. Your applesauce likes great. I make my own unsweetened applesauce, puree it with a blender and eat it with Creme Anglaise- totally yummy. I agree, nothing says fall like apple picking and making apple sauce! I definitely prefer my cold! 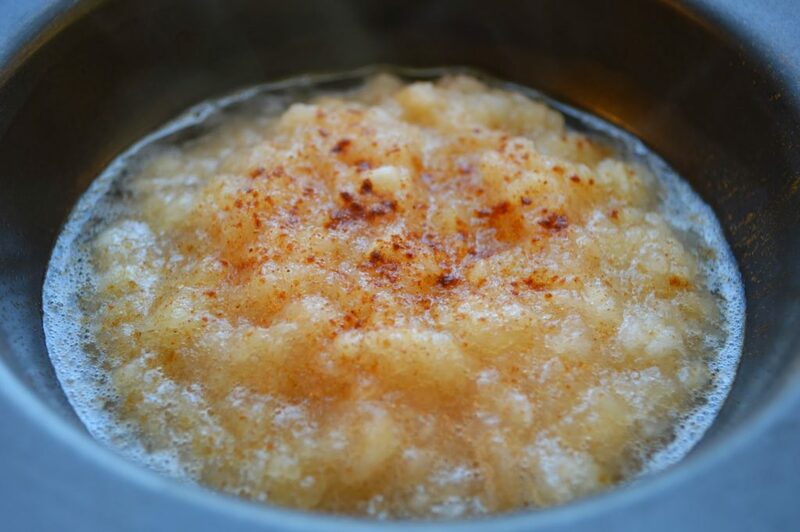 I could eat homemade apple sauce every day! Love a bowl of applesauce – warm and screamin' Fall! This looks so yummy! Thanks for the link up, and your series!